If you're looking for a way to make your celebration more unique, consider taking it on the road. A party bus offers distinctive transportation for any special occasion or night of fun. Luckily, they can be rented in most cities. A party bus is a large vehicle driven by a chauffer. They are usually stylishly designed, with luxurious interiors. Party buses come in various sizes. Smaller buses are more like vans, able to fit 15 or 20 passengers, while the largest rentals are the size of charter buses, holding 40 partygoers or more. Some companies charge by the hour, while others charge for the entire day, evening, or other block of time. Party buses can be expensive, but when all of the riders share in the cost, it can be well worth the convenience. When you're on a party bus, it's time for luxury. Lounge on leather couches, entertain yourself with DVD players and flat-screen TVs, take advantage of the wet bar, or dance to your favorite tunes. While many party bus rentals are used solely for transportation to and from an event, some buses are part of the celebration. For instance, FADDS Double Decker in Nashville, offers double-decker party buses with a DJ and an overall dance club atmosphere. The bus isn't transportation to the party - it is the party. Even if you hire a more sedate vehicle, cruising around the city in the company of your friends is a great way to start your night. You won't have to coordinate rides or find parking. Your party bus rental will transport your entire group and drop you off at the door. If you're traveling to an unfamiliar city for a business meeting, conference, concert, or sporting event, you won't have to worry about finding your way to the venue. If your celebration involves alcohol, a party bus will eliminate the need for a designated driver. 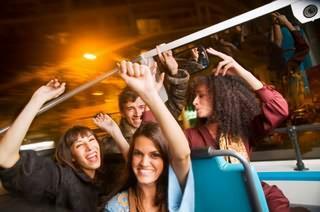 Party bus rentals can also be safer for young customers. A car full of teenagers on the way to prom can be a definite distraction to an inexperienced driver. Parents can enjoy peace of mind knowing their children are in professional hands. When a limousine or party bus drives by, heads turn. If you like to make an entrance, you can't beat stepping out of these stylish vehicles. There are no national party bus rental companies, so you'll need to search for local providers. In addition to looking specifically for party buses, you should also check with limousine rental companies. Many will also include buses in their fleet. Plan ahead. Many companies only have a handful of party buses, and the earlier you reserve one, the better your selection. If you wait too long, you may be left without any transportation. This is especially true if you're hiring a party bus for a widely-attended event like a concert or a prom. Will the party bus make multiple stops to pick up or drop off passengers? If you're paying for a set period of time rather than an hourly rate, what are the charges if you arrive home late? If you are a parent taking advantage of a party bus rental for your teen child, be wary of easy access to alcohol. While limousine rental companies certainly don't want to run afoul of the law by serving alcohol to minors, you should still make your feelings on the issue clear to the company and the driver who arrives that night. Try to select a party bus that doesn't come with a bar set-up, but if you can't avoid a bar, make sure it isn't stocked. Simple steps like these can make for a safer experience for young partiers. A party bus is perfect for everything from prom to a bachelor party. Whether the party bus takes you to the real celebration or the bus is the party, unique transportation gives any bash a special touch.